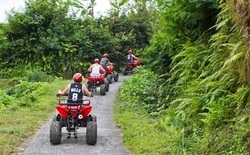 Jungle ATV Jatiluwih Bali provides you a great opportunity to explore and get closer to the beauty of Bali nature and its rural areas. 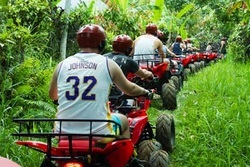 Let’s have a fun on ATV ride and give yourself time to be back to the nature. Our trek is absolutely amazing and not monotone ( rice field, plantation, bamboo forest, jungle, river, villages, and picturesque panorama ). 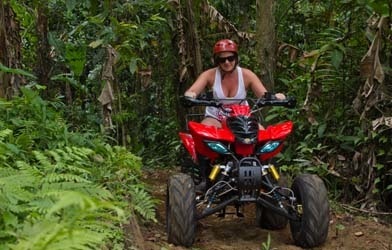 Do you really want to be back to the nature while pampering your adrenaline on QUAD BIKE ? So, let join with us and create the unforgettable memories and experiences. Beginners ? No Problem - all ATV Quad bikes are automatic and semi-automatic and incredibly safe and easy to ride. No prior driving experience needed. It's fun for everyone !!! 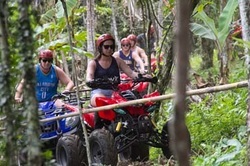 Jungle ATV Jatiluwih Bali provide an extreme adrenaline-fueled, unforgettable, safe hours of fun as you ride ​and explore the beauty of Bali countryside .